When Avatar came out, I couldn’t help but get swept up in James Cameron’s astonishing conception. This is because a hopelessly bad movie was redeemed only by an awesome visual feast of digital artistry, And others were equally swept up. So much so in fact that I noticed at the time that there was a popular sense of despairing yearning for a world as beautiful and stunning as Pandora. Which led me to start a slightly flippant post called Antidotes to Post-Pandora Blues. I never finished it for some reason, but the exhilarating new Hockney exhibition this morning at the Royal Academy brought it back to mind. I had been hoping to come up with a whole list of antidotes, but for some reason got distracted after only 3. The RA exhibition is entitled A Bigger Picture – no prizes for guessing why (though the ‘bigger’ theme harks back to his California years when he first found fame with his 1967 ‘A Bigger Splash’, right). 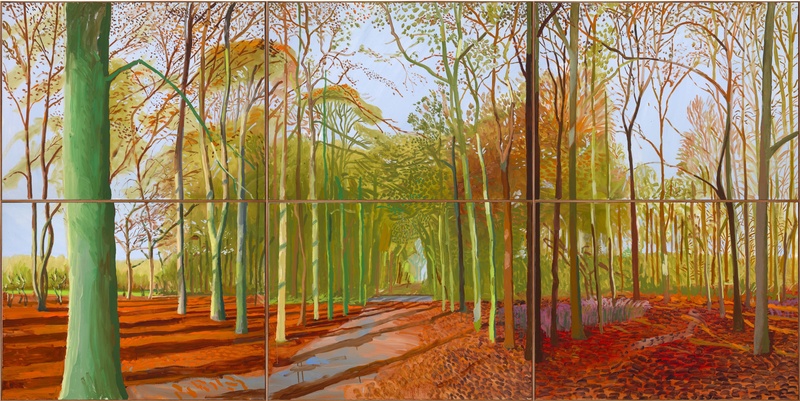 But it seems to me that Hockney’s development of these multi-canvas works is not about making grandiose statements or attention-grabbing headlines. These paintings are attempts at offering full immersion into the natural world. The impossibility of capturing on canvas even the remotest sense of a place as breath-taking as the Grand Canyon seems to inspire or even taunt Hockney. By offering an image that far exceeds the bounds of normal fields of vision, we are invited to step right into the world he is observing, far more effectively than any single canvas can. His Grand Canyon pictures are famously effective (see below) – one of the great aspects of this RA exhibition is its juxtaposition of older multi-canvas works with his Yorkshire landscapes of the last 5 years. Some will probably think I’m getting all pseudy – and unless one sees, or rather experiences, these paintings, it will probably seem slightly over the top. But I came away feeling more in love with the beauty of our world not less – because I’d been made to see it through fresh eyes. And you don’t need to invent an alien digital world to have that experience. Far from it – you just need to go outside. I could go on and on. But won’t. Sell your shirt to see the exhibition. It won’t disappoint. It is FAR more worthwhile an investment than an Avatar DVD. And the best thing about it – this is the real world. And you’ll want to explore it even more. Perhaps especially because you emerge from the RA into the chaos Piccadilly, it made me want to get out into the countryside as soon as possible. Sadly, we’ll have to wait for a month or two before getting the chance. © All rights reserved by David Hockney and the respective copyright holders. Thanks for sharing this, Mark. You have encouraged me to look for an opportunity to visit the exhibition. Great to have your views and a little taster. I’m booked in for Feb 13th – can’t wait! Love the art, really beautiful and alive. “Recognise that Planet Earth’s Creator is INFINITELY MORE reliable than James Cameron” – at least you can ask James a question and get an answer…, but what really puzzles me is why would you use Thinking and Logic to prove that your Faith is Infallible? I don’t want to go into a big discussion, but I think the fall of Spirituality is caused by over-protection by reason. Thanks for your comment – while i completely understand your perplexity (if that is what it is) with what I said, I’m not sure I was applying any logical proofs here at all. I was merely pointing out, on the basis of an authentic Christian, and indeed generally theistic, worldview what is the case. Of course, that entails all kinds of other assumptions, convictions and arguments (for which, as you imply) this is not quite the place. That is a discussion for another place. I suppose in some ways all I was doing was trying to provoke a way of looking at things that is different from the prevailing scientific materialist understanding of the entirely closed universe. Perhaps I’ve therefore succeeded…! “prevailing scientific materialist understanding of the entirely closed universe”, hmm, prevailing where? Since 86% of World population adheres to some Religion, 54% of those are Monotheists and 33% are Christian. So, I could conclude that all those non-religious and atheist people are really in a minority. But, the world is not statistics, I see your point – Modern Industrial Civilization is run by Profit and Exploitation of Resources – nothing spiritual there, even general humanitarian qualities are fading away… Sad to see everyone involved in this scam – everyone is trying to make a buck on each other, and where money rules it matters not whether you’re religious or not, it all erodes just the same. I’ve found your blog after reading your review of the SUM, David Eagleman’s book. For me the important thing about this book was that it gave us more ‘options’, even if all of them are wrong, in the environment where people fight over ideas and even kill each other for their belief – this is a HUGE relief. In any case, dogmatism in any form or field is not healthy. We shouldn’t try to prove our faith, but instead just continue learning and uncover our own ignorance about this Beautiful Universe, and maybe if we will, god will come back or we become like gods. Sorry for the ramble, and good luck! Thanks again for your comments, Nick. Keep dropping by and perhaps there’ll be things to connect with some time…!